This illustrated talk will discuss the recent refurbishment of the V&A’s Toshiba Gallery of Japanese Art, which originally opened in December 1986. The refurbishment was made possible thanks to funding received from the Toshiba Corporation as part of the extension of its naming of the gallery until 2021. 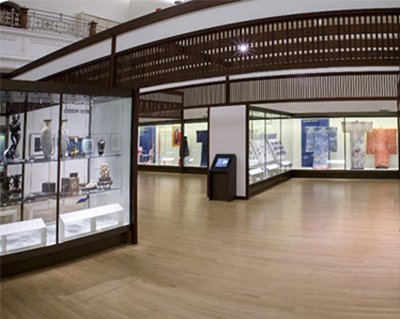 The basic design of the gallery remains unchanged, the display cases and overhead wooden structure inspired by Japanese architecture being the same as when the gallery first opened. The main changes have been to the interiors of the cases, for example the replacement of textile-clad base-boards and back-panels with powder-coated steel and, most noticeably, the introduction of state-of-the-art LED lighting. Improved labelling and the introduction of blue section panels with clearly visible section titles have made the gallery far more readable than it used to be. The opportunity was also taken to review the contents of the gallery, including the reversal of the chronological drift from north-to-south to south-to-north. In keeping with the findings obtained through audience research, a greatly expanded area of the gallery has been devoted to the modern and contemporary. No longer just the studio crafts that featured in the gallery’s previous incarnation, the displays now include photography, fashion, street-style, electronics, furniture and product design, with a Hello Kitty rice-cooker having quickly established itself as the most photographed object in the gallery. Rupert Faulkner is Senior Curator, Japan, in the V&A’s Asian Department. He joined the Museum in 1984 and was involved in preparations leading to the opening of the Toshiba Gallery of Japanese Art in December 1986. He is responsible for the V&A’s collections of woodblock prints, Japanese ceramics and – an area in which he has been especially active – contemporary Japanese crafts. He was lead curator for the refurbishment and redisplay of the Toshiba Gallery, which re-opened to the public on 4 November 2015.